We are not saying that Joseph Smith should be rejected as a prophet of God solely based on his polygamous and polyandrous ways. Joseph Smith lied to his original wife Emma about his polygamous ways, as she only knew of several. Joseph Smith not only took other men’s wives but also married teenagers as young as 14. Despite the clear commands not to take sisters or mother/daughter combinations, Smith took had ten wives in such situations. Despite his adulterous ways, Joseph Smith never apologized or repented for his actions. If these points are all true, Joseph Smith was not the virtuous man many Latter-day Saints may think he was. Before we go any further, let’s be sure we fully understand the meaning of the terms we will use on this page. According to Merriam Webster, polygamy is the “state or practice of being married to more than one person at the same time.” Because the “gny/gamy” suffix in that word refers to females, polygamy refers specifically to one man marrying–legal or not–two or more women. Meanwhile, polyandry is the “state or practice of having more than one husband or male mate at one time.” Because the “andry” suffix in this word refers to males, this is specifically referring to a woman marrying two or more men. The first plural marriage in Nauvoo took place when Louisa Beaman and Joseph Smith were sealed in April 1841. Joseph married many additional wives and authorized other Latter-day Saints to practice plural marriage. Sealings for time and eternity included commitments and relationships during this life, generally including the possibility of sexual relations. Eternity-only sealings indicated relationships in the next life alone. Evidence indicates that Joseph Smith participated in both types of sealings. The exact number of women to whom he was sealed in his lifetime is unknown because the evidence is fragmentary. Most of those sealed to Joseph Smith were between 20 and 40 years of age at the time of their sealing to him. The oldest, Fanny Young, was 56 years old. The youngest was Helen Mar Kimball, daughter of Joseph’s close friends Heber C. and Vilate Murray Kimball, who was sealed to Joseph several months before her 15th birthday. How many wives did Joseph Smith have? Who were Joseph Smith’s wives? Many who know about Smith’s polygamous ways may assume that these women must have been widows or “old maids” and their prophet was doing a favor to them by marrying them. However, the idea that Joseph Smith somehow rescued his plural wives from being single is just not accurate. The fact of the matter is that Smith met the majority of his wives when they were just preteens or teenagers. In fact, about a quarter of Smith’s eventual wives (nine of them) were 12 or younger when Smith met them, even as young as 5 (Sarah Ann Whitney) or 6 (Nancy Winchester). Over the years, Smith nurtured these relationships until he married them, with the vast majority of these marriages taking place between 1841 to 1843. At least a quarter of his wives were no older than teenagers when Smith (who was in his late 30s) married them; the majority of his wives were under 30. 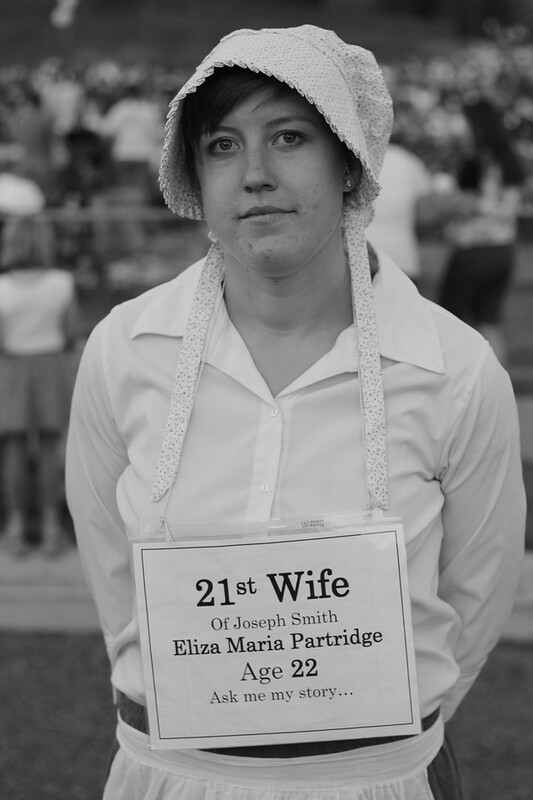 Only an eighth of Smith’s wives were older than he was at marriage. Check out George A. Smith’s list of Joseph Smith’s wives and when Mormonism’s founder met/married these women that was originally published on page 36 of his book. For another list of Joseph’s wives as recorded by LDS scholar Todd Compton, go here. Ten of Joseph Smith’s wives were teenage girls – two of whom were 14. Another pair were 16. The practice of girls marrying this young was not a normal practice even in the 19th century. And it certainly was a very unusual practice when it is considered that Joseph Smith was an already married man in his mid-30s when he married these girls. Smith married several sets of sisters (Huntingtons, Partridges, Johnsons, Lawrences). However, God said in Leviticus 18:18: “Neither shalt thou take a wife to her sister… to uncover her nakedness, beside the other in her lifetime” Leviticus 18:18. Smith married 11 women who were already married to living husbands. All of these married women lived in ongoing polyandrous relationships with both their husbands and Joseph Smith. For a list showing this to be true, click here. The man that committeth adultery with another man’s wife… the adulterer and the adulteress shall surely be put to death. If any man espouse a virgin, and desire to espouse another, and the first give her consent… and they are virgins, and have vowed to no other man, then is he justified; he cannot commit adultery for they are given unto him; for he cannot commit adultery with that that belongeth unto him and to no one else… But if one or either of the ten virgins, after she is espoused, shall be with another man, she has committed adultery. Did Joseph Smith have marital relations with his plural wives? Conjugal relationships would make sense, according to the LDS scripture the Book of Mormon. While God is portrayed in Jacob 2:24 as declaring plural marriage “abominable before me,” verse 30 adds that the practice would be allowed only in order to “raise up seed [produce children] unto me.” Yet if producing children legitimizes polygamy, why did Smith marry ten women who were already married to living husbands? Couldn’t these men have been satisfactory “seed” suppliers? In addition, Bushman says that “not until many years later did anyone claim Joseph Smith’s paternity, and evidence for the tiny handful of supposed children is tenuous.” If raising up “seed” was the lone exception to polygamy, it seems odd that there is little to no evidence that Smith ever produced children through his martial relationships with these multiple wives. The Gospel Topics essay then rationalizes, “Marriage at such an age, inappropriate by today’s standards, was legal in that era, and some women married in their mid-teens.” The fact is that those in their mid-teens in nineteenth century America rarely married. The average age of marrying in the 1830s and 40s has been estimated (through U.S. Census records) of the early twenties. Even if marriage at this age is legal, this doesn’t make it moral. For instance, while fifteen-year-olds with parental permission are allowed to marry today in the state of Utah, a case could be made that the majority of girls this age are nowhere close to being mature enough—either physically or emotionally—for a lifetime commitment. Besides, few parents today would allow their teen-age daughter to marry someone like Smith who was more than twice her age. In addition, the essay failed to acknowledge that any union between a female of any age and a married man in the nineteenth century was illegal in every state, just as it is today! Did Emma Smith agree with Smith’s polygamous ways? Some Latter-day Saints have rationalized Smith’s behavior by saying his wife Emma knew about and encouraged the practice. Actually, Emma Smith approved of plural marriage for only a short time but otherwise was consistent in her rejection of polygamy as well as her husband’s involvement with this practice. In their book Mormon Enigma: Emma Hale Smith, LDS researchers Linda King Newell and Valeen Tippetts Avery clearly show this to be true. For more information on this question, please click here. Did Joseph Smith know what he was doing was wrong? Some Mormon apologists try to rationalize these quotes away and claim Smith is taken out of context or that his words somehow should be softened when considered in their 19th century context. How can this be when Smith denied he was involved with three dozen women and claimed he was married to only one? And then he has the audacity to boast how he was able to keep a church together when, in actuality, it was crumbling all around him? Remember, at the beginning of this page, we said that we were not saying that Joseph Smith is a false prophet solely based on his polygamous and polyandrous ways. At the same time, however, character counts. If Joseph Smith truly was an authentic prophet of God, and if he was instructed to practice plural marriage, then this practice should be accepted as moral. However, if the practice of polygamy as participated in by Joseph Smith is counter to God’s revelation of the Bible, then we must ask: Did Joseph Smith really hear from God? If not, could his polygamous ways be nothing more than a convenience factor to follow a chosen immoral lifestyle? Joseph Smith was a polygamist as well. He indeed married teenagers and other men’s wives. Do these facts bother you? If so, then perhaps Joseph Smith is not the man of God that Mormon leaders have made him out to be. Read more about the issue of polygamy, especially as it relates to Joseph Smith, by clicking here. Would you like to learn 10 reasons why you ought to consider becoming a Christian? Go here. If you have any questions about this page or the topic of Joseph Smith’s polygamy, write us: contact at mrm dot org. We would love to hear from you.